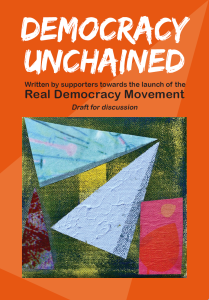 Democracy Unchained is offered as a draft for discussion by supporters of the project to create a Real Democracy Movement. Brought together by people in Kent, Wales, Yorkshire, London and Scotland, it includes a range of thoughts about what is wrong with the existing system, a vision of what a real democracy could look like and how to make it a reality. In their various ways, Trump’s victory and the EU referendum vote are seismic events. Traditional forms of representative democracy have lost their appeal, authority and legitimacy. Many have come to conclude that the existing democracy, the state system and the capitalist economy which it prioritises, cannot provide, much less guarantee, the basic requirements of life – jobs, a decent standard of living, shelter, and human rights. Above all, it is paralysed in the face of runaway global warming and eco-extinction. This opens up grave dangers as right-wing populist leaders and parties manipulate the discontent for their own reactionary ends. Millions have demonstrated in Washington, London and around the world in opposition to Trump’s presidency. Huge divisions have opened up in the very heart of state institutions. In the UK, the judiciary, parliament and the executive are in deep conflict over Brexit and its implications. Inequality, meanwhile, is growing and public services like the NHS are starved of funds and face collapse. The clear and present danger is an opportunity to concentrate minds on the need to come together to create a Real Democracy Movement. 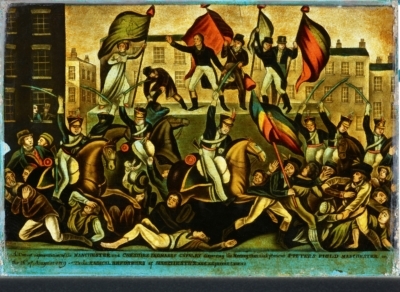 The long history of struggle for democracy can inspire this work. Creating a vision for the future in a collective way and acting on our conviction is vital to counter the outright lie that no other future is possible. Democracy Unchained is not intended as a completed or final manifesto. It is simply an initial document for you to critique, add to, improve and change. Your thoughts on what kind of organisation is needed are particularly important. Please read it, share it as widely as possible, comment on it and put forward your ideas at meetings, online and via social media so we can produce a revised draft and prepare to launch the Real Democracy Movement as an organisation during the course of 2017. Those like Tom Watson campaigning for a 2nd referendum are not interested in extending democracy. For them, it's a backdoor way of thwarting democracy and stopping Brexit altogether (and undermining Corbyn). They should be honest enough to admit that. Don't hold your breath. Hundreds arrested as Extinction Rebellion step up action against climate emergency. They need our support.